At certain times of the year, I love Sci-Fi, particularly anything with an dark weird inhuman Asimov flavour. 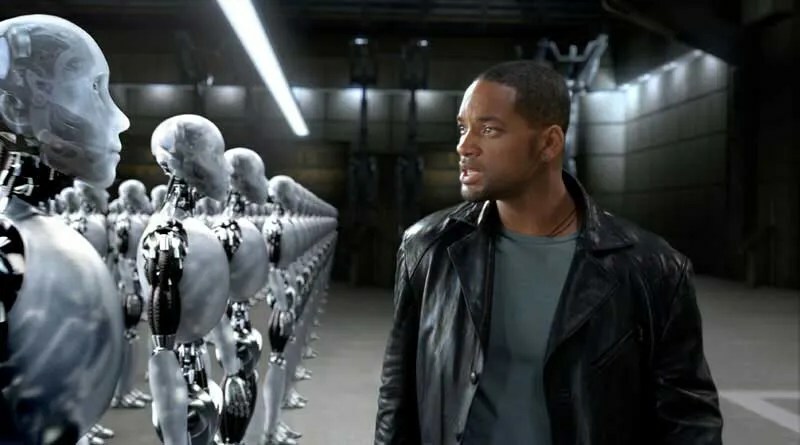 Therefore one of my favourite film is Will Smith’s I-Robot, a story about a futuristic humanity where robots have become highly functional (and cool, I might add). Now this film has been out for a long time, and I’ve always enjoyed sitting down to watch it. So here I would like to do a little analysis of the various aspects of the film (after all, no human story is perfect, leaving space for juicy analytical potential). For the time (2004), the special effects were very impressive, and drew one into this weird futuristic world. Sadly, unlike, for example Jurassic Park which came out 10 years before), the special effects have not held up as well as I would have liked. That set aside, (as I wouldn’t have wanted them trading off the awesome NS5’s for anything that they could have made more believable in 2004) really the special effects aren’t that bad at all, and, on first viewing, I’m sure one wouldn’t notice! 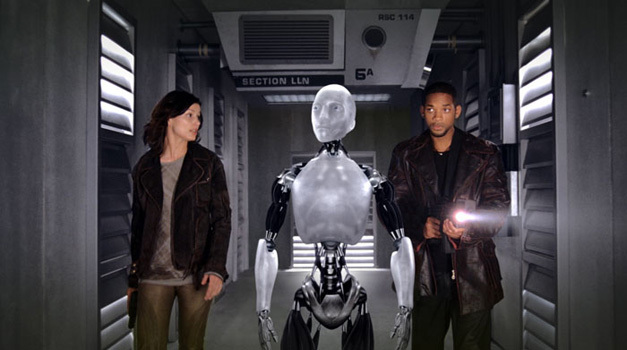 The film’s protagonist is Detective Spooner (Will Smith), a highly skilled, but emotional cop with a grudge against all robots (not technology, mind, but rather any attempt to replace humans). He is then put on a case of an apparent suicide with a message intended for him. This leads him onto a fairly complex case with several lines of causality. As he pursues this case, increasingly dramatic things happen, eventually centering culminating in an awesome climax (as you may have notices, I am unashamedly biased in favour of this film). Unlike some film adaptations of some other classics (e.g. The Lord of the Rings), this film not only differs quantitatively but also qualitatively from the books. First of all, the story is not an original Asimov story, but rather attempts to tie in with Asimov’s ideas. Doctor Calvin (the lady), for example, is clearly taken from a Doctor Calvin in Asimov’s work. However, in the film, she is portrayed as significantly less cold than in the books. She is a more relatable, less alienating character. This of course, was a good move on the film makers’ part. It also serves to illustrate other changes that were made to the feel of the world, and how they made it more appealing to the modern audience. Another clear difference is that the film assumes the existence of the integrated circuit, which even Asimov didn’t imagine existing back in the fifties. This means that the technology of the film is much more compact, as opposed to the huge clunky grid-connected robots of Asimov’s world. The film starts by showing these staples of Asimov’s short stories, and continues to use them as a backbone to the major conflict of the story. And being so fundamental, one could say that because of this inclusion, the film really has kept the spirit of the originals by having them play such a major part. Emotion and Intellect – On my most recent watching of the film, an aspect that really struck me is how the film constantly refers to the apparent conflict between emotion and reason. Detective Spooner starts out as this very emotional person with a confused grudge against robot-kind. In contrast, Doctor Calvin (the lady on the left of the above picture) is shown as a cold, unfeeling engineer. then of course you have Sonny, the most recent breakthrough in Robot intelligence, who is highly skilled, but is also learning to feel reality, and also (once) actualising irrational emotion. Now I thought that this portrayal actually felt a bit clumsy. I would have appreciated a more subtle portrayal of this aspect, which felt a bit unresolved/confused. I didn’t get the impression that the protagonist had really developed much from the plot. Technology – Obviously, this film very much centres on Artificial Intelligence, in a similarly vague way to how Asimov dealt with it (this mysterious “Positronic Brain”) and although I don’t take hard AI too seriously, I always did find the idea, and it’s potentiality, fun, if anything. The solution to the three laws of robotics – I must admit, until just now, I didn’t actually understand this. But now I realise that the second part of the first law of robotics creates this loop hole. Not only must a robot not harm a human being, but it must also prevent said human from being harmed. This suggests the idea that robots’ only legitimate solution to best fulfilling the three laws is dominating humanity to such an extent that humans are never able to harm each other. Of course, this is a political assertion, except its object is not a state, but robots. Would you like to live in such a “safe” world? The thing about most Science-Fiction is that, admittedly, it is all quite boxed-in in comparison to other stories. It does not really centre on life and eternity (like Fantasy, for example) but simply technology, and its potential. This of course makes it fun/cool to watch, but also quite trivial. That said however, I personally put I-Robot high on the list of films that fulfils that aim of Sci-Fi, for it does exactly that: It explores the potential of technology in a fun and exciting way! This entry was posted in Blog Posts on Thursday, the 17th of Aug, 2017 by Joe.